Three investors wish to purchase one third each of a profitable UK trading company. One investor is tax resident in the US, one in Canada and one in Australia. They wish to structure their affairs to be as tax efficient as possible whilst not interfering with the existing operations of the UK company. Each investor would be liable to pay full rates of local tax on dividends received from the UK company, as well as full rates of capital gains tax from any subsequent sale of shares in that company. Incorporating an offshore company, or one company for each investor, to hold the shares in the UK trading company might, in theory, provide a way of deferring tax on the income and capital gains pending distribution. But in practice, US, Canadian and Australian anti-avoidance legislation would attribute the undistributed income and capital gains of an offshore company to the beneficial owner and tax them as though all income received by the offshore companies had been received directly by their beneficial owners. 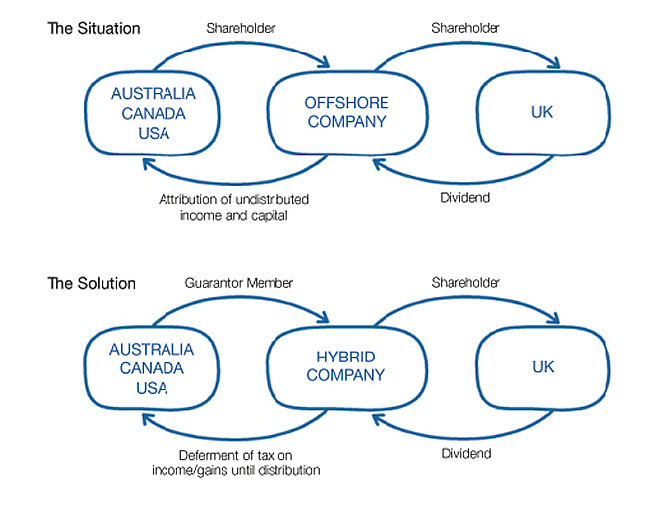 In other words, US, Canada and Australia all require the interest in the offshore company to be reported, rendering the offshore structure ineffective. Each investor should incorporate a hybrid company, structured specifically to take into account the anti-avoidance legislation of his country of residence, and use such a company to hold his shareholding in the UK trading company. Hybrid companies are limited both by shares and by guarantee and can therefore be effective in deferring payment of tax on the underlying income and capital gains until actual distribution. By using these vehicles tax can be deferred indefinitely. In the case of the Canadian and Australian investors, distribution could be delayed until such time as the investor has moved to a low or zero tax country when it would no longer be liable to Australian or Canadian tax. The US investor could not employ such a technique because, irrespective of his country of residence, he would still be subject to US tax. But considerable advantage could still be obtained for the US person by deferring the tax and being able to reinvest out of the untaxed funds.